RadioVelvet continues its officially licensed Star Wars: The Last Jedi Australian Artist Edition T-Shirt Collection with this fantastic Porgs tee by Ken Taylor. Who knew Porgs could look this awesome!?! The Blot’s a huge fan of Taylor’s artwork and posters, and his line work in this The Last Jedi design is insane! I would love to see a matching screen print of this Porgs piece be released one day. 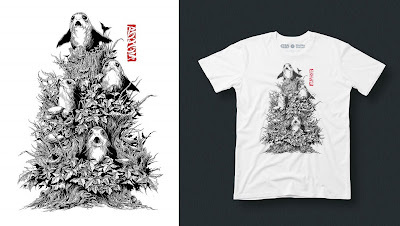 The Star Wars: The Last Jedi “Porgs” Artist Edition T-Shirt by Ken Taylor is currently available, in sizes S-2XL, at the RadioVelvet online store for $75.